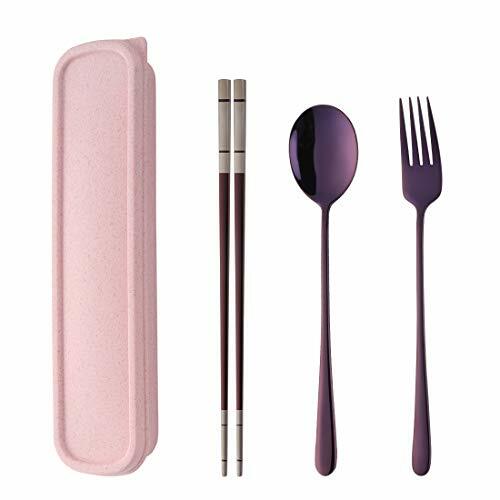 Specification: Set Included: 1 set tableware (1 fork + 1 spoon + 1 pair chopsticks) + 1 box Material: 304 18/10 stainless steel Color: Blue Box + Silver Tableware Blue Box + Blue Tableware Pink Box + Pink Gold Tableware Purple Box + Magic red Tableware Green Box + Gold Tableware Wheat Box + Black Tableware Pink box + Purple Tableware Size: Spoon: 8 inch long, chopstick: 9 inch long, fork: 8 inch long, carry case: 10 inch long, 2 inch wide. 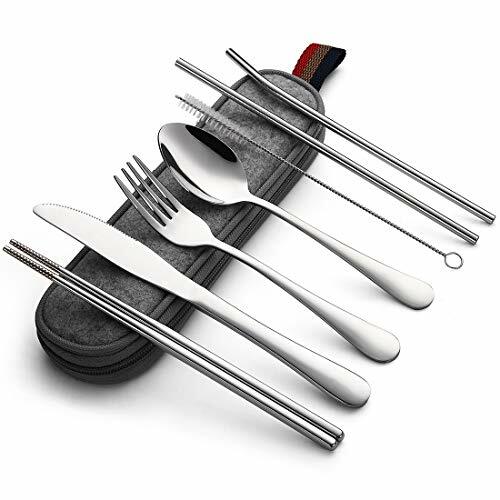 Safe to use: The cutlery set were made of high quality stainless steel, anti corrosion and rust prevention. The box is also made from food-safe materials, non-toxic and tasteless. Have CE / EU, CIQ and LFGB certification. Care instructions: * Dishwasher-safe (no harsh detergents), but hand wash is recommended. 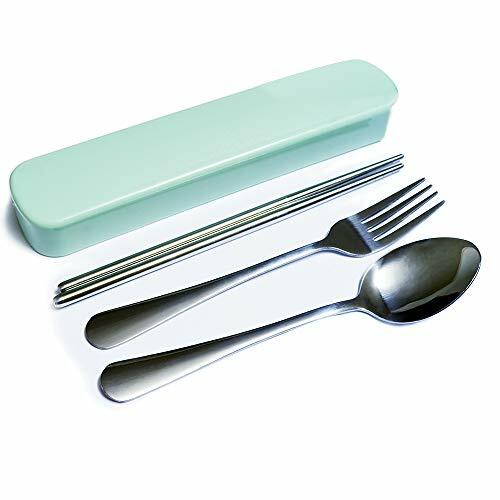 * Wash, rinse and dry your flatware and box before using it for the first time. Wide use: Be applicable for all the people, especially for individuals, as students, workers and family who go camping, hiking, outdoors, and in vacation. This will also be a best gift for your friends or guests Welcome to our store! Hope you will appreciate and like our products. If have any questions, please feel free to contact us and we will solve the issue asap. Have a nice day! Set Included: 1 set tableware (1 fork + 1 spoon + 1 pair chopsticks) + 1 box +1 storage bag Material: 304 stainless steel Color: Pink Box + Silver Tableware Green Box + Gold Tableware Blue Box + Rose Gold Tableware Beige Box + Black Tableware Blue Box + Rainbow Tableware Size: Spoon: 8 inch long, chopstick: 9.17 inch long, fork: 8.35 inch long, carry case: 9.56 inch long, 2.34 inch wide. 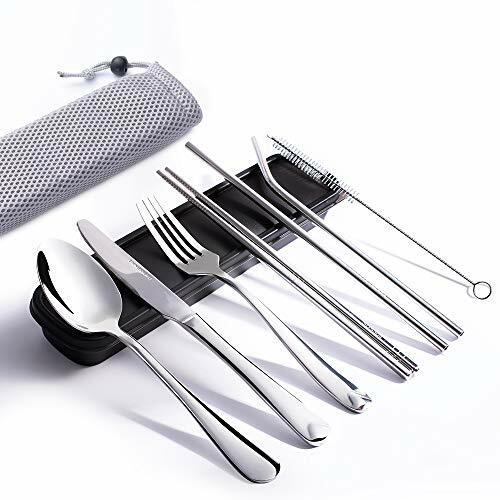 Safe to use: The cutlery set were made of high quality stainless steel, anti corrosion and rust prevention. The box is also made from food-safe materials, non-toxic and tasteless. Care instructions: * Dishwasher-safe (no harsh detergents), but hand wash is recommended. 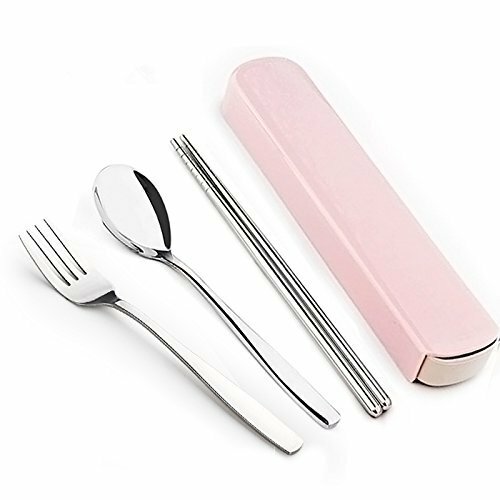 * Wash, rinse and dry your flatware and box before using it for the first time. Wide use: Be applicable for all the people, especially for individuals, as students, workers and family who go camping, hiking, outdoors, and in vacation. This will also be a best gift for your friends or guests Welcome to our store! Hope you will appreciate and like our products. If have any questions, please feel free to contact us and we will solve the issue asap. 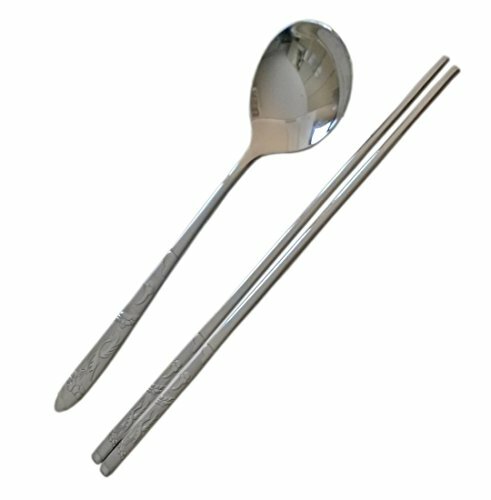 From the earliest times Koreans have always used a combinations of something to scoop with and something to pick up with. Before the metal spoon and chopstick came along, the shell of a clam was probably used for a spoon and two pieces of wood for chopsticks. 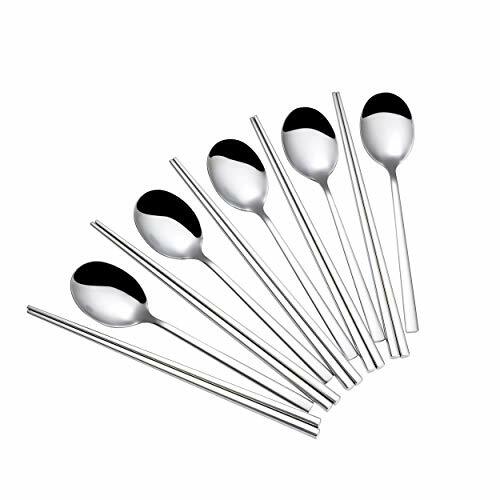 Since the discovery of smelting, nickel, bronze, gold, silver and other metals have been used to make the spoon and chopsticks. 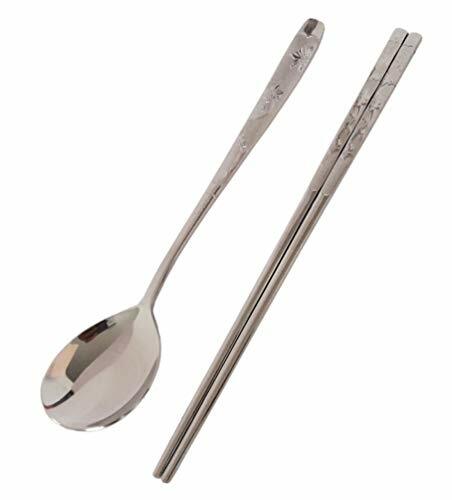 Most Koreans use the spoon for eating their rice and chopsticks for side dishes, though there are some who think it proper to use the spoon only for soup. 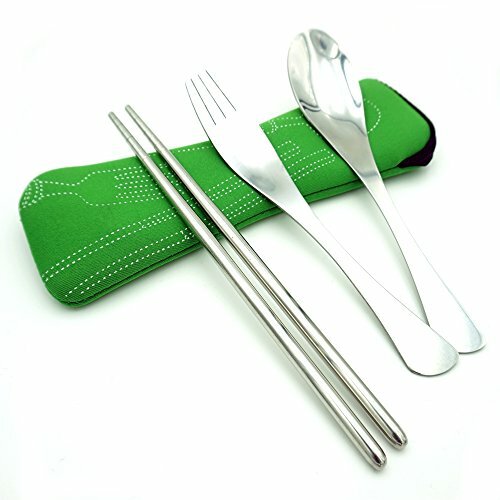 Why choose Ccinny Reusable Flatware Set ?❤ ❤ 【100% MONEY BACK GUARANTEE】We aim to bring you nice dinning experience. 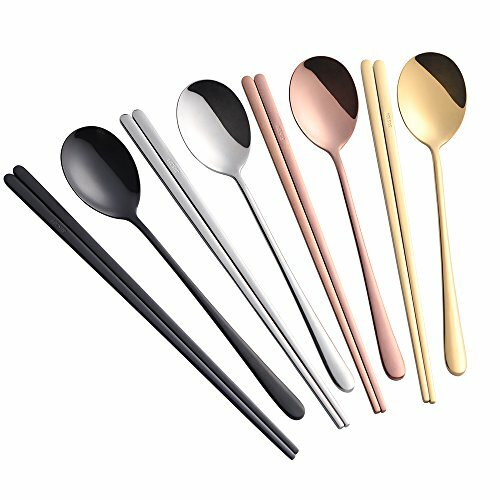 If there is any quality problem of our flatware set,welcome to contact us,we guarantee full refund or replacement for you. 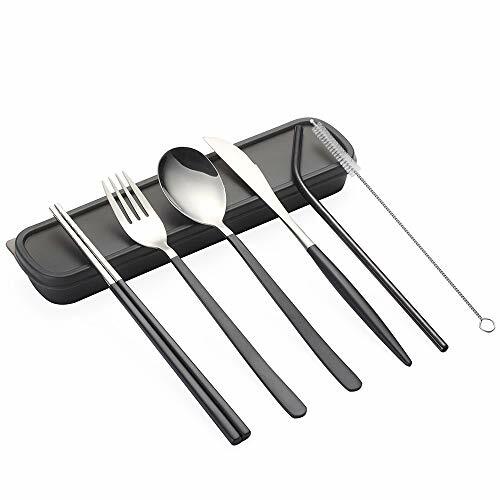 Every Flatware Set includes a Fork, a spoon and a pair of chopsticks. 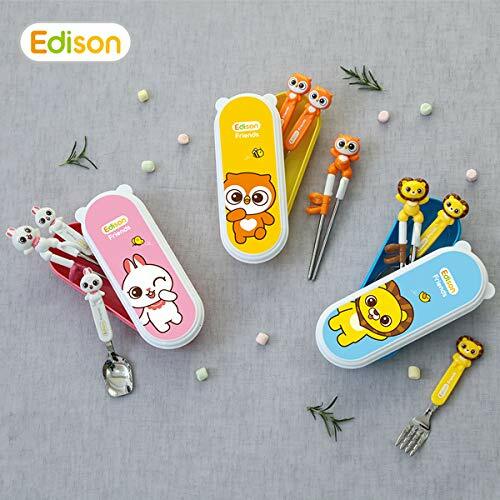 ❤ ❤ 《1》Made food grade 304 stainless steel and high quality ceramics , safe and healthy for your family and kids . 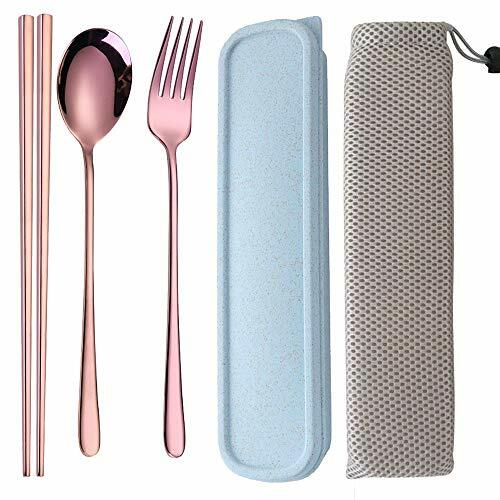 ❤❤ 《2》TRAVEL CASE FOR CONVENIENCE: Keep your utensils clean and within easy reach with our travel case! 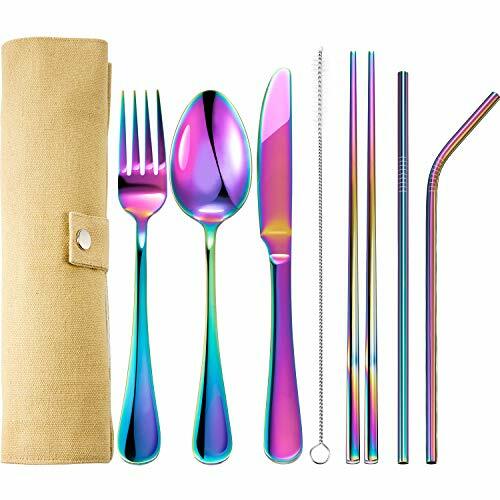 ❤ ❤ 《3》If you are looking for an eco-friendly way to stop using plastic utensils,this is a great silverware for work,camping,hiking,backpacking, picnic or anything you like ❤❤ 《4》Package Included: Case*1, Spoon*1, Fork*1, chopsticks*1pairs ❤❤ 《5》Made of food grade stainless steel. 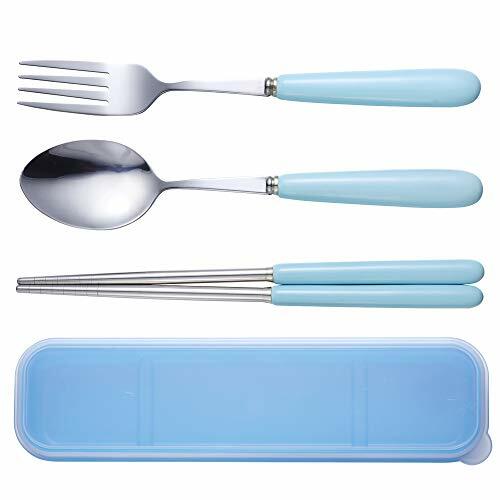 durable and reusable cutlery sets,High quality and heat resistant ❤❤ 《6》High quality Plastic Case makes it cute and travel friendly! 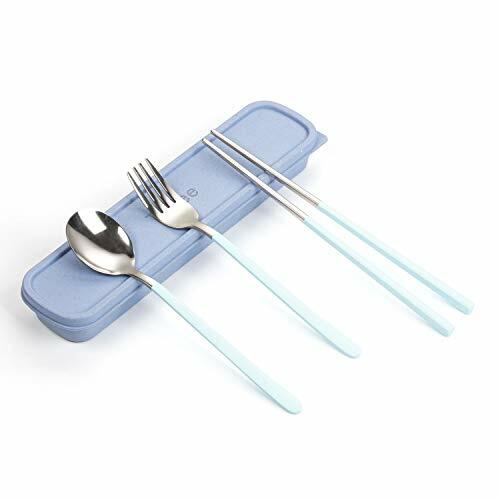 Durable, lightweight stainless steel 3 piece set (spoon, fork & chopsticks). Great for traveling or outdoor activities. Keep clean: stored in stylish, washable neoprene case. Lightweight - only 50g. Great for travelers and carrying in your bag or backpack. Handy for office, car, sky, camping, scouts, holidaying and more. 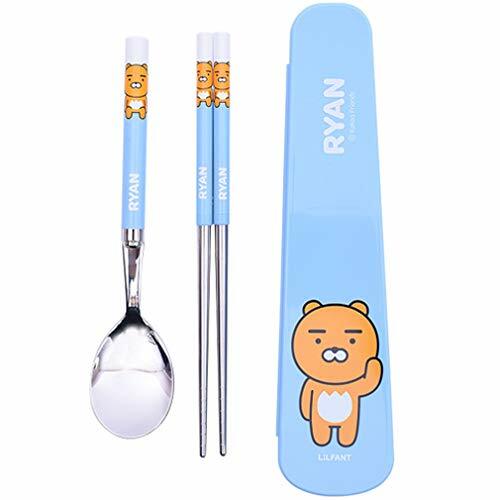 Size: Spoon & fork:6.5 inch, Chopsticks: 7.5 inch. 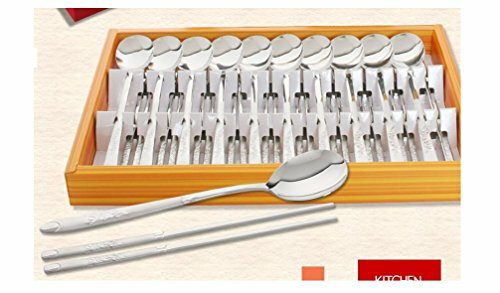 Korean spoon and stainless steel chopsticks set with etched Mosaic Pattern. 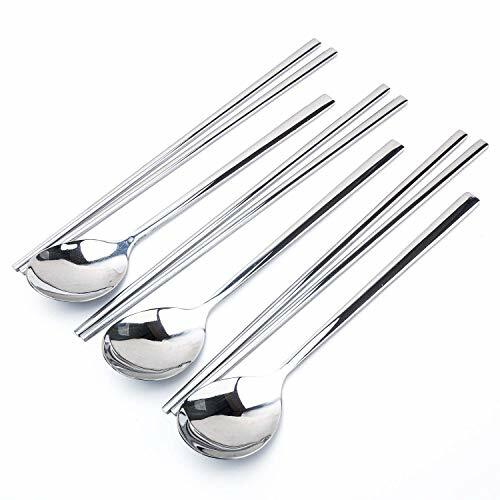 Polished stainless steel every day-use chopsticks. 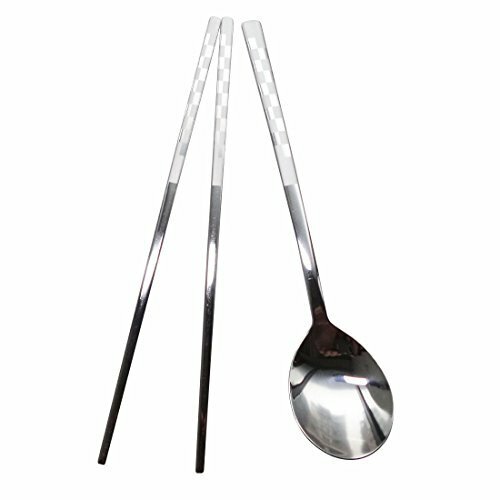 Classic Korean chopstick shape - flat like silverware - these chopsticks are 9 inches long and 1/16 inch thick. Made in Korea.